At the 15th annual NCTO meeting, outgoing Chairman William V. McCrary Jr. painted a picture of the U.S. textile industry and the association’s achievements and upcoming goals. 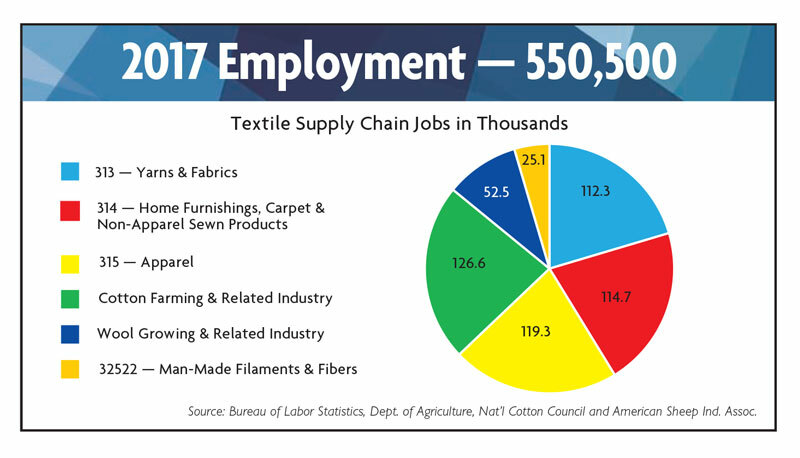 It has been an amazing year for the U.S. textile industry and the National Council of Textile Organizations (NCTO). President Trump’s pro-manufacturing agenda is forcing Washington to do what NCTO has long sought — rethink policies on trade, taxation, regulatory reform and a host of other issues. an estimated $7.3 billion for man-made fibers. As we examine these numbers, it is important to note that the heavy job losses incurred because of massive import surges in the 1995-2008 time frame, virtually have stopped.5 Today, like most other U.S. manufacturing sectors, fluctuations in employment figures are generally due to normal business cycles, new investment, or productivity increases. 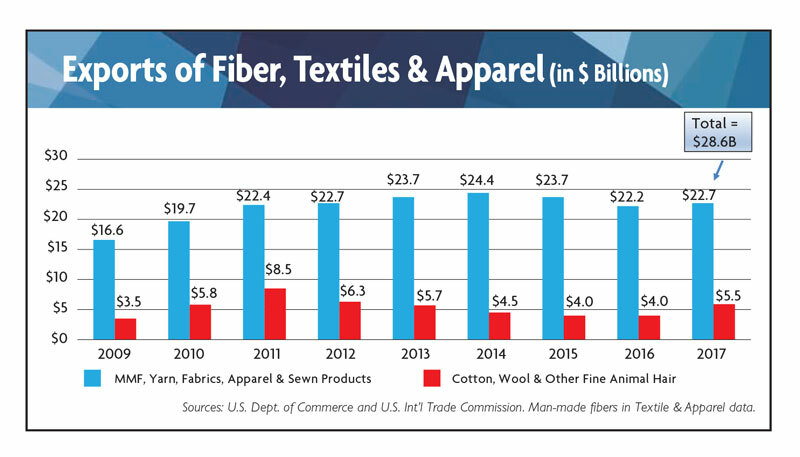 U.S. exports of fiber, yarns, fabrics, made-ups, and apparel were $28.6 billion in 2017.6 This is nearly a nine percent increase in export performance over 2016. Shipments to NAFTA and CAFTA-DR countries accounted for 54 percent of all U.S. textile supply chain exports. $2.0 billion – Rest of World. $473 million – Dominican Republic. The numbers show the fundamentals for the U.S. textile industry are sound. This is true even though some markets for U.S. textiles and apparel were soft last year. For the most part, any sluggishness was due to factors beyond control, such as disruption in the retail sector caused by the shifting of sales from brick and mortar outlets to the internet. With that said, the U.S. textile industry’s commitment to capital reinvestment and a continued emphasis on quality and innovation make it well-positioned to adapt to market changes and take advantage of opportunities as 2018 moves along. Let me be clear, NCTO strongly supports NAFTA. That said, NCTO agrees with President Trump that NAFTA can and must be improved. With respect to government procurement policy, NCTO steadfastly supports the Berry Amendment. This “buy American” provision for the military is an example of how the government and private sector can work together for mutual benefit. The U.S. military gets a secure U.S. supply line for thousands of superior, highly-advanced products. In return, the domestic textile sector receives $1.5 billion to $2 billion in annual Defense Department sales that boost U.S. investment and employment. NCTO urges Congress to follow President Trump’s lead by drafting and passing a comprehensive plan to rebuild America’s infrastructure. Besides boosting U.S. productivity and facilitating commerce, infrastructure is a key market for textile products such as workwear, geosynthetics and filtration systems. Infrastructure is a growing market for textile composites too. Fostering a national culture of innovation is also important. NCTO urges continued support for the Advanced Functional Fabrics of America (AFFOA). This Defense Department-funded program is matched three-to-one with private dollars and tasked with making it easier to develop and commercialize the next generation of high-performance textiles. Effective April 1, NCTO merged with the American Fiber Manufacturers Association (AFMA), a fellow trade group representing domestic manufacturers of man-made fiber. From NCTO’s perspective, the merger with AFMA adds new members, financial resources and extends NCTO’s political reach. It also enhances NCTO’s status as the voice of every facet of the U.S. textile production chain, a fact that will help NCTO more effectively influence policies made in Washington that impact U.S. textile investment, production and workers. As outlined, NCTO is involved in the policymaking process on all major matters affecting the textile production chain. This includes key international trade negotiations, congressional initiatives, federal procurement, and regulatory activity. This merger, will allow the domestic fiber sector to be fully aware of what is transpiring in these areas and to have an effective voice in influencing policy outcomes. In other activities, NCTO’s American Textiles: We Make Amazing™ campaign is helping to rebrand the U.S. textile sector’s image because its manufacturers have a great story to tell. America’s textile industry is world-class thanks to leveraging the most cutting-edge production processes, investing in the best machinery, and leading in sustainability and innovation. Generating more than $3 million in earned media coverage. Judging by the engagement generated by American Textiles: We Make Amazing marketing efforts, more and more people are getting an accurate, positive description of our sector, and as a result, are viewing the U.S. textile industry in a new light. Although the U.S. textile industry is world-class, it cannot afford to rest on its laurels. There always will be intense and sometimes unfair competition from abroad, changing consumer demands and inevitable economic downturns. Outgoing NCTO Chairman Bill McCrary (right) passed the gavel to incoming Chairman Marty Moran. 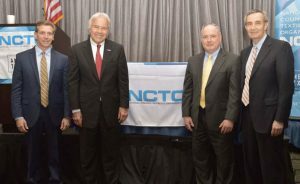 The 2018 NCTO Annual Meeting recently wrapped at the Capital Hilton in Washington. A snowstorm cancelled many flights in and out of the regions’ airports, which left some NCTO members forced to cancel their travel, while others were delayed in their Washington arrival. The association noted meeting registrations have been on the rise over the past few years, and NCTO was looking forward to a record attendance in 2018 based on registrations until the weather intervened. However, participation was still solid and the final headcount of 140 was just under last year’s number. Attendees at the meeting represented more than 70 textile companies in addition to invited government and industry guests. Day one of the event kicked off with meetings focused on the Berry Amendment and government contracting policies, as well as individual council meetings to organize policy for the year ahead. Day two featured speakers from AFFOA, a briefing on The United States’ budgetary outlook and a TextilePAC update. NCTO members then headed to Capitol Hill to discuss industry objectives with key members of congress. According to Lloyd Wood, NCTO’s director of public affairs, despite the snow-imposed government shut down, most of the congressional meetings lined up by NCTO took place as scheduled. Only a handful were cancelled. 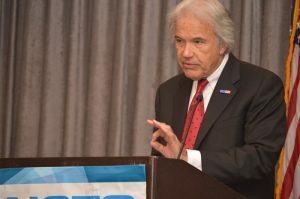 During the open portion of the meeting held on the final day, outgoing NCTO Chairman William V. McCrary, president and CEO, William Barnet & Son, gave the annual State of the Textile Industry update. Following was a Cyber Security Panel comprised of Justin Zeefe, executive director and cofounder, NISOS Group; Ellen O’Day Sundra, regional vice president of System Engineering, Public Sector/Global Government, Forescout Technologies; and Jim Hemsley, IT manager, Techmer PM LLC. The final presentations of the morning came from Robyn Boerstling, vice president of Infrastructure, Innovation and Human Resourcese Policy, National Association of Manufacturers; and Norm Orenstein, political scientist/resident scholar, American Enterprise Institute. (left to right): Marty Moran; Bill McCrary; Don Bockoven, incoming NCTO vice chairman; and Auggie Tantillo, NCTO president and CEO. 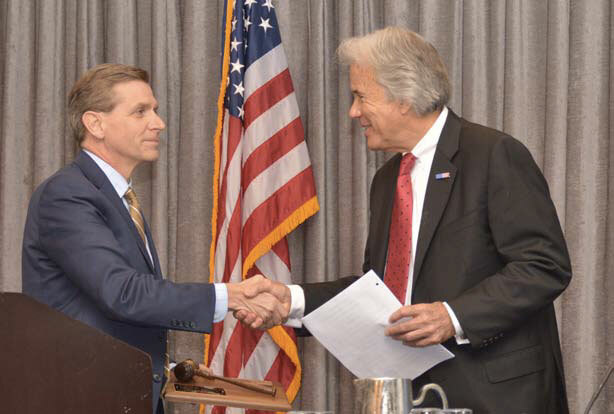 Before the meeting ended, McCrary passed the gavel to Marty Moran, CEO, Jefferson, Ga.-based Buhler Quality Yarns Corp., who was sworn in as the 2018-19 NCTO chairman. Don Bockoven, president, Leigh Fibers Inc., Wellford, S.C., will serve as the association’s 2018-19 vice chairman. 1 Source: U.S. Census Bureau Annual Survey of Manufactures (ASM). Data covers NAICS categories 313 (Textile Mills), 314 (Textile Product Mills), 315 (Apparel), and 32522 (Artificial and Synthetic Fibers and Filaments). 2017 Data for NAICS 32522 is not yet available. Our 2017 estimate for the value of shipments in that category is $7.3 billion. 2 U.S. Census Bureau Annual Survey of Manufactures (ASM). Data covers NAICS categories 313 (Textile Mills), 314 (Textile Product Mills), 315 (Apparel), and 32522 (Artificial and Synthetic Fibers and Filaments). 2017 Data for NAICS 32522 is not yet available. Our estimate for the value of shipments in that category is based on data from 2016. 3 U.S. Census Bureau, Annual Capital Expenses Survey (ACES). Data covers NAICS categories 313 (Textile Mills), 314 (Textile Product Mills), and 315 (Apparel). 4 U.S. Bureau of Labor Statistics, U.S. Department of Agriculture, National Cotton Council, and the American Sheep Industry Association. 6 Data for textiles and apparel is from The Export Market Report produced by the U.S. Department of Commerce, Office of Textiles and Apparel (OTEXA). U.S. export data for cotton, wool, and fine animal hair is calculated from the U.S. International Trade Commission Interactive Tariff and Trade DataWeb using HTS Codes 5101, 5102, 5103 (wool), 5201, 5202, and 5203 (cotton). Editor’s Note: William “Bill” V. McCrary Jr. is chairman and CEO of Spartanburg- based William Barnet & Son LLC. He served as the 2017-2018 NCTO chairman. 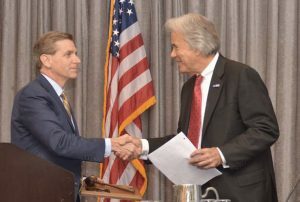 At the recent annual meeting in Washington, Marty Moran, CEO of Jefferson, Ga.-based Buhler Quality Yarns Corp. succeeded McCrary as NCTO chairman for 2018-19.